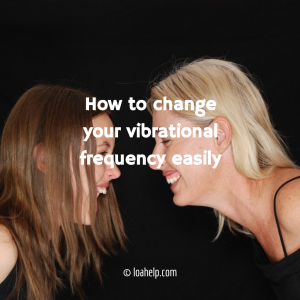 Are you asking yourself how to change your vibrational frequency? Let me show you 3 of my favorite ways that raise my vibration with ease and grace! You can do the same. They work like a charm and are pretty effortless to execute. Above all: they are absolutely free. Your personal vibration should be your number 1 priority in life. The higher your vibes are, the stronger you will feel. People with a high vibrational frequency are successful, happy people who enjoy a great health and feel in the flow. They feel empowered and strong enough to face life’s challenges. But you will be much better capable to deal with difficult situations and tough times. The higher your vibrations are, the more powerful you will feel, no matter what happens in your life. If you feel powerful, you can handle disasters in life much better, than when you vibrate low. When your vibes are high, external influences won’t the same impact as they used to have. For example people with a negative attitude and energy field around them won’t match your vibration anymore. When you are vibrating at higher frequencies your energy field is protected most of the time against negativity. Which is a great thing of course. You are able to stay on a high energy frequency, instead of feeling overwhelmed by all the low and negative vibes around you. All the bad and sad stories can’t take you down no longer. You will still feel compassion for those who suffer, but you won’t suffer from it yourself. There is no need for that. Changing your vibration to higher levels is also a great way to be more successful with the Law of Attraction too. You will be strong and positive and radiate beautiful energy. The Universe will respond with matching physical manifestations in your life. That is law! When you are vibrating on a low frequency, you will usually attract lack and limitations, bad luck, poor health, etc. You won’t feel very happy. This changes when you raise your vibes. It doesn’t matter if you have failed trying it before. Also your age, education, origin, background, present circumstances, etc. are irrelevant. The steps are so easy that anyone can do it. If you are reading this and you understand the meaning of the words you read right now, you can. Congratulations! Let’s start shall we… Let’s answer your question on how to change your vibrational frequency! Over the years I learned the importance of maintaining high vibes. I am extremely grateful I learned it the right way! Knowing how to do it has been a life saver to me many times. Especially during hard times. It took me many years to find out. I will save you that trouble. I am so happy to share my personal experiences with you. It saves you a lot of blood, sweat and tears so to say. You have access to the information for free. Now it’s of course up to you to use it. Reading alone won’t change anything! You have to practice it to experience the difference in your own energy field. Below are my 3 favorite ways to raise my vibes. They are so easy! People with a high vibrational frequency know the importance of smiles and laughter. It’s one of the best ways to almost instantly raise your vibes.! Try it for yourself right now. Put a smile on your beautiful face and keep it there for about 5 minutes. Then come back over here and notice the difference! Smile as much as you can throughout your the time you are awake. Start your day with smiling for a couple of minutes before you get out of your bed. No matter how grumpy you feel. It works even when you feel horrible and want to scream and shout at the world. Laughing out loud for no reason at least 2 to 3 times a day is also a fantastic vibe changer. Please laugh till your belly hurts and tears roll down your cheeks! Simply start by laughing out loud gently and then slowly but steadily make it louder. You can use laughter meditation videos on YouTube if you need some support to get yourself rolling over the floor. Below is a great one that helped me a lot every time I had a hard time to get myself into the “ROFL zone”. I still use it every now and then, just because I love watching it. It is so funny and always makes me feel so good! I just know it will have the same effect on you. Laughing and smiling are amazing and yet such simple tools. They increase your serotonine levels. Serotonine is a hormone that makes you feel good. So now you know how to produce your own natural feel good drug. Ain’t that awesome? It is so easy to smile and laugh. Don’t only read about it and forget to practice what you’ve read. No more excuses if you have been procrastinating the act of smiling/laughing. Go do it right now. Say cheese! Don’t bother about the neighbors and/or your family/roommates, etc hearing your cheerful sounds. The worst thing that can happen is that your laughter is contagious. It is the best gift you can offer. All “infected people” will feel better instantly. What a beautiful thing to do for humanity! Okay, maybe when you feel down you will have to push yourself a little bit. If that is you in this moment, then will you please smile for me right now… Even when you don’t feel like it at all. 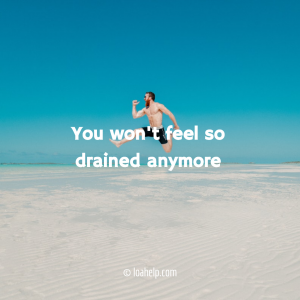 I promise you that you will feel a huge difference! It won’t hurt. Give it a fair try. When you feel happy already, you will also enjoy these smiling and laughing habits! Make it your way of living to smile (almost) all of the time and laugh out loud a lot! Another awesome way to change your vibrational frequency is as simple as gazing at the stars and/or gazing at a point somewhere far away in front of you, when you are outside in nature. Although you can do the same when you’re in a city, the impact on your vibration will be less effective. You need to be in a natural environment like a forest, a beautiful park, the sea/ocean, etc. to fully benefit from it. The trick here is not to focus, but simply stare. Do this for a couple of minutes, a few times a week. It will drastically improve your life. Your vibrations will raise. The funny thing is, that this is based on science. Psychologists often give this exercise to clients who are depressed. It works! 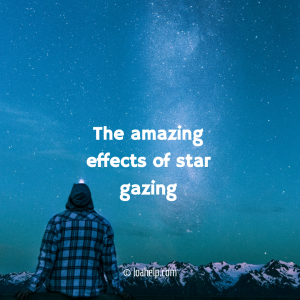 This article shows the results from scientific experiments with star gazing. They concluded that it makes people kinder. When your vibration is high, you will be kinder and gentle with people. This happens automatically. It is a sign your vibes are in the winning mood! To me star gazing when I am in nature works so well. I still do it on a regular basis as a form of “high vibe maintenance”. I want to stay in my high vibrational frequency! This exercise is so easy and yet so effective. Above all, it’s pleasant and it works really fast. I highly recommend you try it yourself. Certain music has beautiful effects on our energy field. Music has (sound)vibrations too. Be aware of the music you listen to though. It can also lower your vibration! Choose feel good music in general. You will notice the difference. Pay close attention to lyrics that are used. Words have vibrational power, so please avoid negative ones. Cheerful music is always a good way to feel much better. Please don’t listen to sad songs about the drama in life. It sinks into your subconscious mind and has more impact than you might think right now. Sad lyrics have a sad vibration. You are a sender and receiver of energy. So if you want to raise your vibes, please don’t choose tearful songs. They won’t empower you at all! Tibetan singing bowls are great for better vibes. Below you can listen to a beautiful video that will raise your vibrational frequency. Play it in the background while working. I love listening to this kind of music when I am writing on my websites or am doing research online. Or even when I am doing chores in the house. You can also play it right before you fall asleep. Barok classical music (only if you like it) is another beautiful type of music that takes your vibration to higher levels. You can search on YouTube for free barok classical music videos. One of my favorites is this one. It works the same as with the Tibetan singing bowls. Listen to it while doing other things. You don’t have to sit and meditate to benefit from the effect. It’s enough that you pick up the sounds. Enjoy! How do you change your vibrational frequency? Of course there are many more ways to raise your vibration. For this article I just picked my 3 favorite ways. In the near future I will definitely share more tips and tools to support your vibes. I am sure you have your favorite methods too. Please share them in the comments below. Let’s support each other to reach and/or maintain a super high vibrational state. I love to hear from you. Sending you Love and Light to boost your vibes even more! Jeez. I was curious to know what vibrational frequency was and I followed the link. I needed it. Hi, Anja. I love the tips on this article and I want to share it on my twitter account. I can do it by copying and pasting your post link. But it will be better if you add and activate social media sharing button on your website. Hi, Anja! What an amazing article! While I read it, I smiled. Thanks for that! We need more things that inspire and motivate us. I love to laugh and smile. One person once said that I am laughing too much. Of course, I am not always laughing and smiling. Thanks for the reminder! When I am in nature, I always feel uplifted. I love to listen to music and paint. Painting always makes me happy. I also think that higher vibration helps with stress and anxiety relief. This article is just so wonderful, I love these ideas but have never tried them. The best thing is they are so simple to follow and 3 of the nicest things that everyone loves doing. I have heard about laughter and music before but not about gazing at the stars. I remember when I went camping and I stared at the stars it felt so good, I could not stop telling my friends to look at them and notice how good they would feel. Thank you for refreshing my memory with all the 3 points and I will try them soon. This was an interesting read! Some of these things I found myself already doing without realizing it. I will admit that some things seem silly at first until giving it a try. I appreciate your insight into this subject. Thanks for sharing this interesting article Anja. I knew, but never really tried laughter to raise my vibs, but I do some smiling sessions in front of a mirror, it works well. I have never done the star gazing but I am sure that it also works. On the other hand I have done a lot of relaxing music picked from YouTube. In fact, I went through a very low period a couple of years back and selected some 3 hours long relaxing music which I used to play softly on my laptop before going to sleep, and I can remember the amazing difference it made of my following day, and days. It is important though to make sure to pick one with no adverts otherwise you would jump up in the middle of your sweet dreams by a blaring advert for the best toilet unblocker. Not pleasant, trust me. I look forward to your future articles Anja. I am sending you some positive vibs. Hi Flavia, thank you so much for sharing your thoughts! I really appreciate that! Star gazing is an amazing way to “reset” yourself. I can relate to the feelings of complete (inner) peace. That’s the same thing that I feel, when I gaze in space! Much Love & Light to you as well. Have a wonderful day! Thanks Anja for this lovely article. I try to raise my vibrational frequency with some of the ideas you have suggested and can attest to the fact that they all work! In fact I’m listening to music right now which I can feel has a great effect. I look on youtube often and there are a lot of pieces on there that really help change my mood, my energy and my emotions, thereby affecting my vibrational frequency – and that can only be good. It is law! 🙂 Have a wonderful day. Ok to change your vibrational frequency I knew about listening to music and laughter. But starring at the stars, that’s something really new and it works!! I actually imagined sitting at the top of a quiet hill alone and staring at the starry sky and FELT SOME IMMEDIATE RELIEF!! Wow, this is magic like seriously. This stuff works hahaha. I really enjoyed reading this post. You made me feel much better about myself. I’m actually smiling now. Wow Stunning Bell, you putted a huge smile on my face now too! Thank you so much for your nice words! Gazing at the stars is extremely powerful! Even visualizing doing so works miracles. Imagine doing it real life 😉 I do it often. Or if there is no starry sky, I just gaze at a point far away in front of me, works the same. You only need to do it for a couple of minutes and boom: high vibes! I’m glad you enjoyed reading my post. It was an absolute joy to write it! Have a beautiful day! Thanks Anja this is exactly what I needed to read today. I completely agree especially laughing out loud – so going to watch some comedy tonight after dinner, and put on some uplifting music with an uplifting essential oil blend in my diffuser – thanks! That sounds like a great plan Fleur! Watching comedies is a great way to exercise your laughter muscles 😀 Have fun with the comedy. Let me know which one you watched! What oil do you use to uplift yourself?